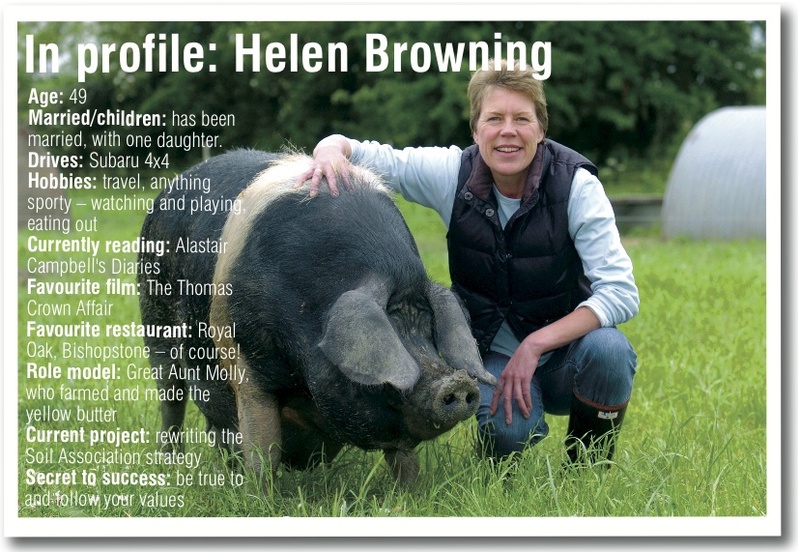 In the first of Bristol Business News’ series of profiles, Soil Association director and award-winning organic farmer Helen Browning talks to Jo Smyth about pigs, pubs and her rise to success. For an active woman, being laid up with a bad back is not something that acclaimed organic farmer Helen Browning is enjoying. Ironically, it was a bumpy trailer ride around Highgrove, that bastion of all things ‘green’, that proved the last straw for her back, which had been giving her twinges for some time. The resulting shifted disc has meant she’s spent the past five weeks unable to sit or lie comfortably. Work, for Helen, is Eastbrook, her successful organic farm in Bishopstone, near Swindon, the village’s Royal Oak pub and her position as director of the Bristol-based Soil Association. In fact, the latter is now a full-time post, so the farm and pub are largely run by her business and personal partner Tim Finney and her “brilliant management team”. The pub is a more recent passion of Helen’s. Having taken on the tenancy about four years ago she has turned it back into a traditional pub, serving great food. But it is her commitment to organic farming and her work with the Soil Association which has won her acclaim; in 1996, aged just 34, she was awarded the OBE for services to organic farming. Much came to Helen at a young age. When she was just 24, having completed her agricultural technology degree, she returned to the family farm in Bishopstone, keen to help out and put some new ideas into practice. She was surprised and delighted when her father asked her to take over. When Helen took over Eastbrook Farm it was mixed – beef, dairy, arable, sheep. Her father had given her free-rein and so she decided to experiment with organic farming. “There are a number of reasons behind my attraction to organic farming. I was interested in health, partly because I wasn’t healthy as a child. And I had seen farming change so much – we lost loads of hedges to make way for the bigger machinery, started using more and more chemicals, wildlife started disappearing at a rate of knots. More pragmatically, I wanted the farm to stand on its own two feet, we couldn’t rely on hand-outs forever. Helen’s first step was to set up a 20-acre trial site within the farm. The results told her much of what she needed to know; for example, the milk yields were higher from cows fed on organically grown clover than on fertilised grass. Initially, one of the two dairy herds was converted to organic. Then over the course of about eight years the farm switched totally to organic production of milk, lamb, poultry and – the product Helen is best known for – pigs. Helen initially sold her goods from the farm gate and for 12 years owned a butcher’s in Shrivenham. The farm began making sausages and curing bacon, selling to restaurants and independent outlets. All did not run smoothly. In around 1989 Safeway took an interest and wanted to stock organic pork; the farm was geared up to go when Safeway pulled the plug because the farm wasn’t able to supply the whole volume needed for launch. The next plan, to scale up to supply a large number of independents, also had to be shelved because the business model was too expensive to maintain. Helen’s response was to change the model and increase sales to supermarkets such as Waitrose and Sainsbury’s, all branded as Helen Browning’s Organic. The 2001 and 2007 national Foot-and-Mouth outbreaks hit the pig business but, by focussing on the brand, they pulled through and their main outlets now are Sainsbury’s and Tesco. Organic milk goes through OMSCo into Somerset-based Yeo Valley in and other processors and grain goes to the likes of Doves Farm in Hungerford, Berkshire. The two main arms of the business are her two Ps – the pigs and the pub. “We took the Royal Oak on because we really want to be a community business, and we wanted to do something here where we are customer-facing. I love it and it’s going really well,” said Helen. Helen’s enterprises as a whole employ around 25 full-time equivalent staff and the business turns over about £4.5 million. It is the Soil Association which now takes up much of Helen’s time. She began her association with it in the nineties as a trustee and now has the full-time role of director. “One of our current focuses here is on everyone having a healthy diet – I know with my animals if I feed them well they are healthy and it’s the same with people. We are working very closely with schools and teachers to educate children,” she said. Plans in the pipeline include resurrecting a meat mail order business, starting an organic orchard and increasing the popularity of the Royal Oak.